On June 25, 2014, after over a year of planning, fundraising, collecting gifts and donations, meetings, and more planning, 18 of people embarked on an amazing journey and mission trip to Tanzania, Africa! 13 of them are members of KLC. They ranged in age from 14 to early 60s – all bringing different gifts/talents that would be used along the way. Almost all of the details of the trip were pre-planned, so they could each enjoy the trip to the fullest. It was the most amazing experience! 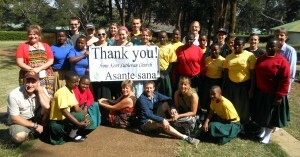 During the 3 week trip, the group would come and go from Arusha town. The first day was spent visiting the Arusha Lutheran Medical Center (ALMC), the nursing college, and the Plaster House (The Plaster House is a rehabilitation home for children recovering from corrective orthopedic and plastic surgery at ALMC). 7 ½ days were spent in Oldonyosambu, staying the TEE Evangelical Lutheran Training Center. During this time, the team had experiences with the people of Tanzania that will remain with them all. Days were spent working with the school children to help them prepare for upcoming tests, cleaning up the grounds around the facility, and a day visit to a Maasai Boma. A Boma is a collection of huts, where an entire family lives; a husband with his wives and children. They live off the lands and have little contact with the oustide world. The group purchased a goat to share with the people. The goat was killed, prepared, cooked, and shared. The experience was amazing! The group spent a few days on safari and saw many animals while exploring the Tarangire National Park, Lake Manyara, and the Ngorogoro Crater. Half way through the trip, the group spent time at David’s farm, Mrefu Mountain Lodge. It was an amazing farm, where the group was treated to wonderful food and hospitality. The team also took a day hike to the first base camp of Mt. Kilimajaro. Following the time spent at David’s farm, the group spent time at a local orphanage, enjoyed a lunch with Pastor Justo, and spent the last few days at the Maasea Lutheran Girls Secondary School. The Girls School was an amazing experience, where the group worshiped with the girls and toured Monduli. Each Sunday while on the trip, the group attended different churches and worship services. Each service was a different and meaningful experience. The singing voices of the people are incredible. Overall, the trip was one that everyone will remember. There are so many pieces of the time spent in Tanzania that bring back memories and will stay in the hearts of each one of the travelers. Many plan to go back someday!